Benefits Amongst its many benefits, Matcha also benefits Super antioxidant Anti-Ageing Protects heart and Lungs Physical endurance and energy Calms and relaxes Enhances mood and aids in concentration Provides vitamin C, selenium, chromium, zinc and magnesium Fights against viruses and bacteria The caffeine in Matcha has a longer staying power than in coffee or energy drinks. 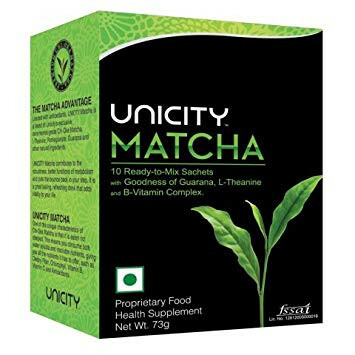 Counter-balanced with theanine, an amino acid that relaxes the mind, Matcha powder provides four to six hours of mild, but stimulating, energy. Matcha is both a relaxant and stimulant; it has been used by Buddhist monks to sustain a peaceful, but alert, state of mind. Essentially, the caffeine derived from Chi-Oka Matcha is more of a mental lift and, unlike the high from coffee. Instruction for Use Mix the contents of one sachet with 200-300 ml of water, stir well and drink. Reccomended one sachet daily. Not recommended for children below 14 years of age.